• How to use MATLAB to work with numeric and symbolic variables, including vector and matrix variables. • How MATLAB supports functions with vectors and matrices as arguments. • Applications such as change of bases, classification of quadratic forms and solutions of systems of linear equations. • How to find various matrix decompositions using MATLAB. • How to work with sparse matrices and other special matrices. • How to manipulate arrays, lists, tables, sequences and sets. • How to use MATLAB to work with matrix algebra over the complex field. 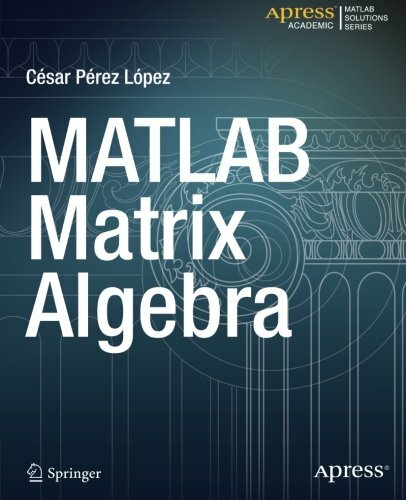 This book is for anyone who wants to work on matrix algebra problems in a practical, hands-on manner using MATLAB. You’ll already have a core understanding of undergraduate level linear algebra, and have access to an installed version of MATLAB, but no previous experience of MATLAB is assumed.